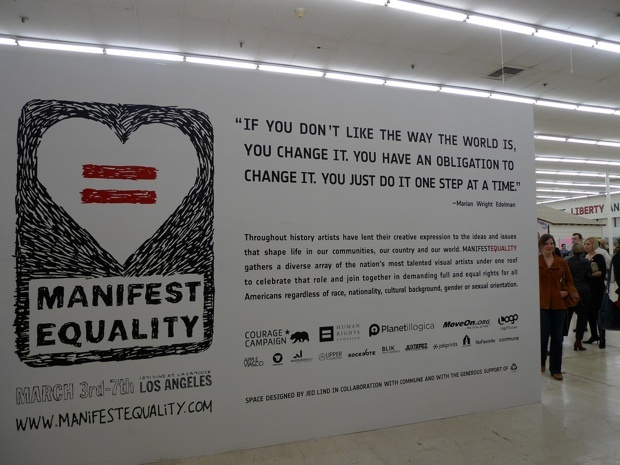 After a very public resignation from the government organization, the community organizer is home in Los Angeles launching Manifest Equality, a massive art show on equal rights. After an appointment to a high-profile federal position that was truncated by a conservative takedown, Yosi Sergant was back in his element last night: In this case, a former Big Lots in Hollywood. 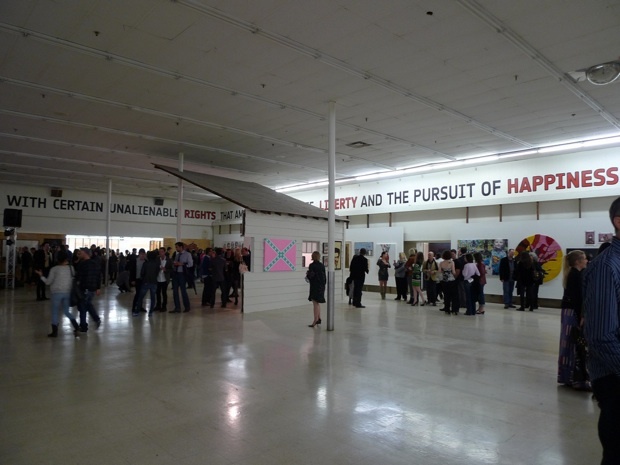 White-hot fluorescent lighting radiated over hundreds of revelers at Manifest Equality, where Sergant had helped to corral 400 art pieces for sale by artists like Robbie Conal, Tim Biskup, and Ron English to benefit the Courage Campaign, a California-based equal rights network. Cleve Jones, the gay-rights activist portrayed in the film Milk, trembled and pumped his fist in the air as he preached about the origins of the AIDS quilt. Milling in the space, which was ringed with Bill of Rights text, were most of the 170 artists–many of them Sergant’s friends–including his most famous and controversial collaborator, Shepard Fairey (aka DJ Diabetic) who was spinning old school hip-hop on turntables in the middle of the floor. That work wasn’t so clear when he arrived as a governmental neophyte at the White House. “I’m a 30-year-old guy who has been passionate about art my whole life, and I had no idea what the NEA did,” he says. He quickly learned they weren’t so certain either. He points to the NEA’s publications (which he says read like a Blue Cross manual) and its Web site as examples of how out of touch the group was with today’s art world. “We should be having conversations about copyright,” he says. “We should be having conversations about how artists are independent contractors and can’t afford heath care. We should be having conversations about how museums are having a hard time getting patrons.” Instead, in Sergant’s department of 14 people, four were dedicated to making books-on-tape. jobs czar Van Jones, and initiated by the same group of people who made the infamous Acorn videos. “They trapped me,” he sighed. 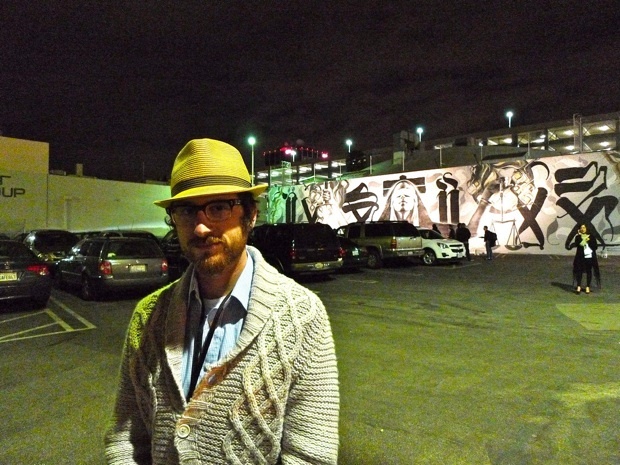 Back home in L.A., Sergant realigned himself with two former collaborators, Jennifer Gross and Apple Via, and began planning a sequel to his 2008 show “Manifest Hope,” a massive art show that has been credited with much of the youth momentum around the Obama campaign which opened at the Democratic National Convention. Driving around L.A. during a visit from D.C., he had spotted the abandoned warehouse store which had been purchased by the Academy of Motion Picture Arts and Sciences to make way for its new museum designed by Christian de Portzamparc. “We pestered the hell out of them to use it,” he says. But the show has another very specific tie-in with the Oscars in that it was specifically planned for this week, with the cameras rolling down the red carpet on the other side of Hollywood. The Academy Awards are perhaps the biggest creativity-focused celebration in the world, yet it has no public engagement with the rest of the creative community in Los Angeles. “People are in town and everyone’s eyeballs are on this fancy-pants event, but if you don’t have a ticket, you can’t go,” says Sergant. 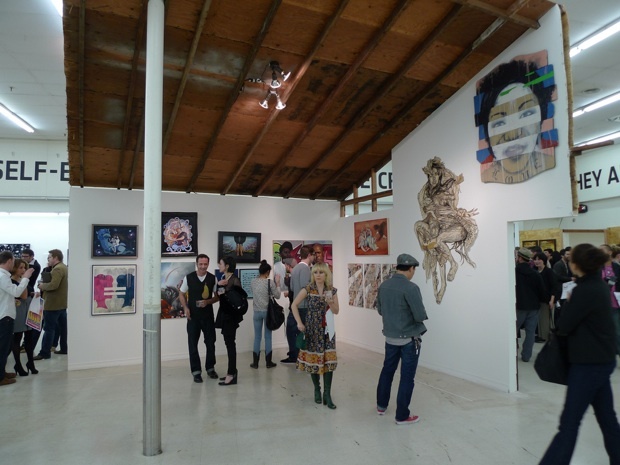 Manifest Equality hoped to not only illustrate civil rights through its artwork, but also though its aims: To capitalize on the attention focused on L.A.’s creatives by turning it into an inclusive, public event for all artists.